If you have children you may be familiar with the dreaded head louse. In this post I’ll show you how to get rid of them safely using essential oils and without dangerous chemicals or pesticides. I myself have been infested with them on two occasions and have lived to tell the tale. I used essential oils from Young Living. the lice have developed resistance to them and so they flat out don’t work. Anybody can get head lice. If you’ve got them just remember that they don’t like dirty hair. So if you’ve got them it’s because you have nice clean hair. Unlike body lice which can spread diseases such as typhus, head lice are not the vectors of any known disease. However, they are very contagious and can spread easily. And it really ISN’T COOL to have blood sucking parasitic insects making their home in your hair. SO WHAT ARE THESE CRITTERS ANYWAY? Head lice are tiny wingless insects that spend their entire lives on the human scalp feeding only on human blood. They cannot hop like fleas or fly, but they do crawl quickly. They are usually found close to the scalp, especially at the nape of the neck and around the ears, but may be found on the eyebrows or eyelashes. 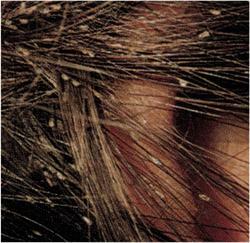 Head-to-head contact is by far the most common route of lice transmission. Their average life span is about a month. An adult female head louse lays approximately 100 – 150 eggs a month. The eggs are usually attached 1/2-inch from the scalp. Eggs hatch within 7-10 days of being laid. 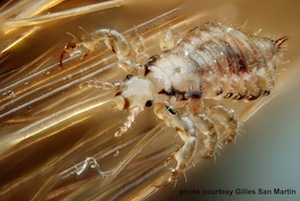 Head lice are resistant to the prescription and over-the-counter shampoos and lotions. That’s why there is an epidemic of them in our school system. 1. Pyrethrins, obtained from the chrysanthemum flower, sound like they all natural and have nothing but good vibes. These are safer than the chemical pesticides, yet they are known to cause respiratory problems, headache, nausea, incoordination, tremors, convulsions and skin reactions. 2. Permethrin and other pyrethroids are synthetic versions of pyrethrin and have a much greater potential for causing toxicity. Animal studies have shown they can suppress the immune system and be toxic to the liver. 3. Lindane, an organochlorine insecticide. Look for the name Gamma-Hexachlorocyclohexane or Benzene Hexachloride (BHC). These are neurotoxins and are structurally similar to banned DDT & chlordane. 4. Malathion, an organophosphate insecticide. You can find online reports saying it has very low toxicity and breaks down quickly. Don’t believe them. The truth is that one of its breakdown products is a chemical called malaoxon which is more toxic than the malathion itself. My advice is to avoid it totally. 5. Inert ingredients, and that does NOT mean it is non toxic. One, Piperonyl Butoxide, can pose a distinct health risk for pregnant women. 1. Remove all nits using a special fine tooth NIT COMB. Nits are most easily removed by combing while the hair is slightly damp. Adding conditioner or a 50:50 vinegar-water solution to the hair will make combing easier. 2. Use therapeutic grade essential oils. I use Young Living Essential Oils. Proper use of essential oils will kill not only the adults, but also the nits. Try one of the following formulas. Apply 1 teaspoon or more as needed of mixture to scalp and hair nearest scalp. Massage over entire head and into hair. Leave in for at least 30 mins. After that shampoo hair or just leave mixture on. Repeat once a day for 10 – 14days. I used Formula 1 above only every second day. 3. All personal articles that have been in contact with the person’s head should be deloused. Normal laundering with hot, soapy water (125 degrees F for 10 minutes), or dry cleaning will kill lice and nits on clothing, bed linens and towels. Combs and brushes should be soaked for 10 minutes in a pan of very hot water. As an added precaution, car seats, furniture, and carpeting contacted by infested individuals should be vacuumed with the vacuum bag being discarded. 4. Children should be instructed not to share hats, clothing or brushes with their classmates. May there be peace in our hearts. May there be peace for all humanity. May there be perfect peace on earth. Greetings Dev! THanK You for posting that great video re essential oil remedies to cure lice. Used it on Kayenne the other night and it worked wonders!!! Will formula 3 be sufficient if you do not have the other essential oils in formula 1 and 2? See if it works for you. Make sure you have good oils and not chemical imitations. I use Young Living Essential oils. They seem to be working. Can I leave this my daughter’s hair over night? I don’t have all the oils for 1&2, but I do for 3. I did order them on ER though. The information given on this website is entirely for educational purposes only. Use of this information is entirely the responsibility of those who choose to apply this information for their personal health and or well being. and should not be used as a replacement for any medical treatment you may currently be undergoing. Application of the information provided without supervision of a licensed health practitioner is done so at the individuals own risk.